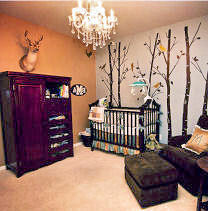 We have some cozy, fun autumn baby nursery ideas to share with you featuring the warm colors and wonders of fall. 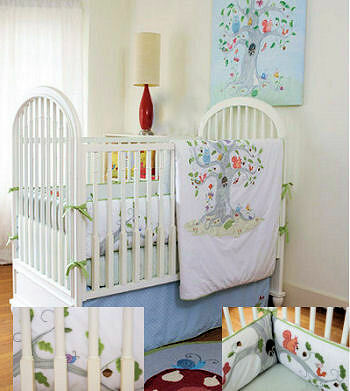 There are pictures of nursery décor in themes that when in place will allow you and your little one to enjoy the beauty of the season snuggled comfortably in the glider. The breezes may be chilly and the nights longer than earlier in the year but we have some decorating ideas with autumnal delights that will prevent the most devoted sun worshipper from missing the beach. Join us while we explore nursery decorating ideas featuring red foxes, squirrels and other forest creatures that, like us, are ready for fall! Baby blue provides a beautiful foundation for the earth tones that are often associated with fall such as dark chocolate brown, rust and a shade of green that is richer than those of spring or summer. These color combinations are vibrant and perfect for baby boy nursery themes. A patchwork quilt with applique squirrels gathering acorns to tide them and their babies over during the long winter ahead will keep you and your little warm while reading a bedtime story . 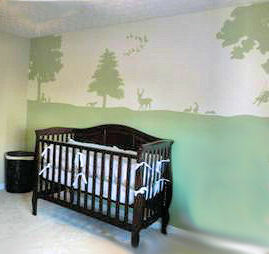 Consider painting a rustic nursery wall mural depicting scenes of autumn such as whitetail deer and geese flying south for the winter. Wildlife pictured in nature will give the space a "cabin-like" atmosphere using warm autumn colors. Deep red, forest green and gold is a winning combination that is often used when choosing fabric swatches and creating a mood board for autumn nursery ideas. Homemade quilts, decorations and furnishings are often seen in nurseries decorated for fall as this is the season when crafts are used to fill time and keep our hands busy during the longer nights. 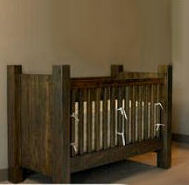 Parents often make good use of their DIY skills and free crib plans to make their baby's first bed. The crisp temperatures make time spent in the woodworking shop more comfortable. As you can see, hints at warmth and spending time with loved ones is an integral part of an autumn themed room. 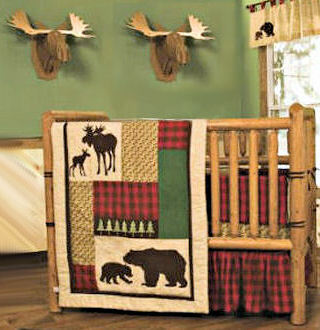 Autumn baby nursery ideas are often based on hunting, a favorite fall pastime of both dad and moms-to-be. A red fox adds a pop of bright color to complement the earth tones of fall. The bright fur of a fox reflects the warm tones of fall leaves where earth-tone squirrels, raccoons, badgers and the like blend into the background. 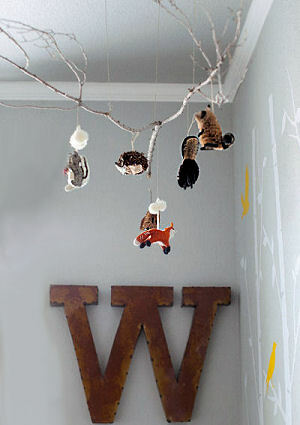 One of the most creative yet least expensive autumn baby nursery ideas would be to make your own homemade baby mobile using a tree branch decorated with ornaments in animal shapes. Shop the sales after Christmas for tree ornaments that can be attached to the branch. Wise old owls are the exception to baby forest animals best left to the colors seen in nature; owls are adorable in practically any color. White owls on navy blue really stand out in a baby boy's nursery and pink ones are cute as can be for a baby girl's room. Owls of any color have been used with great success in decorating for several years and show no signs of slowing down or becoming any less popular in the near future. I hope that visitors to Unique Baby Gear Ideas will fall in love with the autumn baby nursery ideas that have been shared on this page and that you will visit our website often for updates and to see ideas for winter, summer and spring.